Sisters Susan Johnson and Nancy Apatov created Fivesse with the Japanese principle “5S” in mind: Sort. Store. Systemize. Sustain. Shine. Why carry a gym bag, a work bag, AND a handbag, when you can count on one universal bag capable of meeting your every need. While the bag was originally intended for the gym, Fivesse isn’t just for working out. 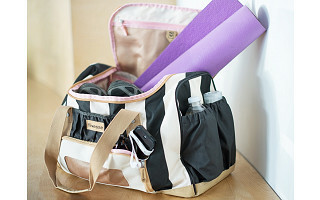 Its sophisticated styling, roomy design, and well-labeled compartments keep you calm, cool, and organized whether you’re exercising, commuting, shopping, or traveling. With a pocket for your phone, sneakers, sunglasses, clothes, dirty laundry, and more, Fivesse helps you put everything in its place. It even contains a custom earbud holder, a key ring, a hidden jewelry pouch, an attachment for your yoga mat or a garment attachment for your nicest outfit. Say goodbye to everyday clutter, and as the sisters like to say "shine on" with a carry all as functional as it is versatile. My sister and I believe that organization is the key to success, not to mention a huge timesaver. We created Fivesse bags for ourselves first and foremost - we wanted bags that were stylish on the outside and well organized and functional on the inside: we were sick of wasting time digging around in our oversized bag, just to find we forgot something pivotal. In our minds there's nothing quite like the satisfaction that comes from having a place for everything, and everything in its place - we hope you agree! We are so excited about sharing our bags with you. We are busy women who workout and saw the need for a better gym bag for women. we wanted more functionality and we wanted them to be prettier! So we designed what we wanted. We hope you like them. Let me know if you have any questions I can answer about the bags. These are great, except for one major flaw - no cross-body strap. Many of us cannot keep bags on shoulders, especially when full. Add this and I suspect sales will jump! 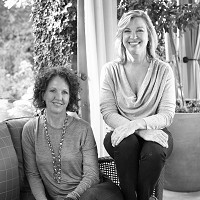 Sisters Susan Johnson and Nancy Apatov created Fivesse with the Japanese principle “5S” in mind: Sort. Store. Systemize. Sustain. Shine. Why carry a gym bag, a work bag, AND a handbag, when you can count on one universal bag capable of meeting your every need. While the bag was originally intended for the gym, Fivesse isn’t just for working out. 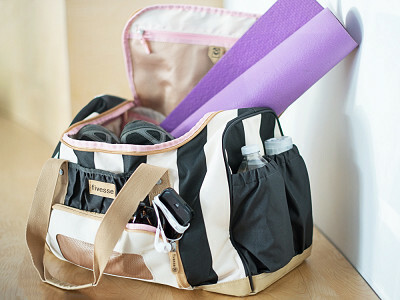 Its sophisticated styling, roomy design, and well-labeled compartments keep you calm, cool, and organized whether you’re exercising, commuting, shopping, or traveling. With a pocket for your phone, sneakers, sunglasses, clothes, dirty laundry, and more, Fivesse helps you put everything in its place. It even contains a custom earbud holder, a key ring, a hidden jewelry pouch, an attachment for your yoga mat or a garment attachment for your nicest outfit.